Jermain Memorial Presbyterian Church was built in 1872 for the congregation of South Reformed Church whose congregation traces its origins back to the South Dutch Reformed Church established in 1642. James Barclay Jermain, (1809-1897), a wealthy lawyer and businessman, had the beautiful church building erected in the Village of Port Schuyler, now Watervliet, at a cost over $120,000. The Church was a memorial to his father, Silvanus P. Jermain (1784-1857). As Mr. Jermain was a Presbyterian, he placed a condition that the building was to be used as either a Reformed or a Presbyterian Church. Rev. Selah Strong was the Reformed pastor. Some early officers of the church in 1872 included John Beattie (shoemaker), Maurice Cashman (grocer), Sarah Elizabeth Cashman (music teacher), Thomas Howie (iron worker), Thomas J. Lacy (carpenter), William Thompson (spinner) and Jane Forsyth (merchant). Following the death of Rev. Strong in 1884, and the increasing number of Scotch-Irish members, the congregation voted to become Presbyterian in 1885, with 224 members. A memorial tablet to Rev. Strong is on the north wall of the church. The first Presbyterian pastor was Walter Laidlaw from 1886-1892. During this period over 50 members came from Presbyterian churches in County Antrim, Ireland, among them were the towns of Balymena, Ballyluffan and Kilrea. From 1892-1912 there were many economic and social changes in Watervliet as the canals and river trade were replaced by the railroads, and there was a constant flow of immigrants. In 1913 a fire destroyed the South Reformed Church, and in 1914 the ruins were reconstructed to become the Barclay Jermain Club, financed by James Jermain’s daughter Maria. This building created space for an expanding Sunday School, plus a kitchen, gymnasium and bowling alleys. The sanctuary of the church features detailed gothic-style woodwork. There was a beautiful new Steer and Turner organ, whose “volume could easily compete with the whistles of Albany Northern Railroad locomotives and the steamboats on the Hudson, with the rattle of horse cars of 3rd Ave. and the shouts of drovers on the Erie Canal” In 1919 an electric pump was installed and in 1946 chimes were added, a gift of Mrs. & Mrs. Guy Beattie. Membership continued to increase and by 1948, the membership had reached 950. 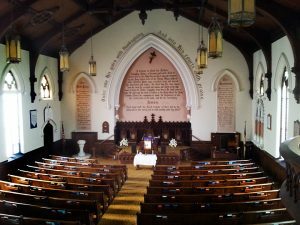 However, membership declined during the 1960’s and in 1971 the congregation began a shared ministry with Woodside and Bethany Presbyterian of Troy, plus Loudonville Presbyterian. On July 18, 2010 the Albany Presbytery, the local ruling body, closed the Jermain Memorial Church due to its small, aging congregation. The Jermain Memorial Church was in an unusual situation. 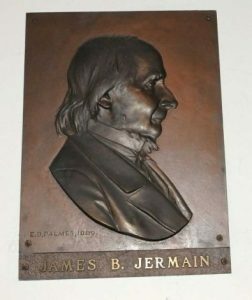 While most Presbyterian churches are held by the local presbytery, Jermain Memorial had a reverter clause that returned the property to the heirs of millionaire James B. Jermain, who paid for the church construction in 1872. The congregation seized on this reverter clause to head to court in an attempt to get the church reopened. 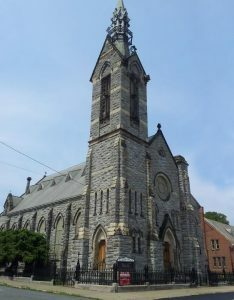 This led to a court fight over the property and in a subsequent ruling by the New York State Supreme Court the congregation was awarded the church and its contents.The church reopened for services on Sunday morning, July 10, 2011 under the new name of Jermain Memorial Ecumenical Presbyterian Church. There are many memorial plaques throughout the sanctuary, including a large list of those who served in both World Wars. An asterisk * after the name indicates “Killed in Action”. Several pews in the church were reserved for the Jermain family, including pew 54. 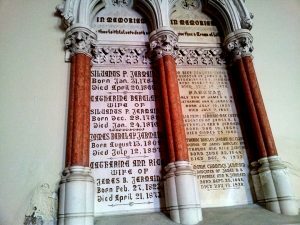 The following Memorial Names that were found in Jermain Memorial Presbyterian Church were transcribed by TIGS volunteer Rebecca Rector.